I've noticed something with the signature picker in ERDAS and I was wondering if it is a bug or a feature. When I create classes I assign a colour to make them easily readable in the classified image. For example blue for the sea, white for clouds and gray for urban areas etc. However the RGB numbers created by merging selected signatures, change depending on what colour I pick. Is this supposed to happen or is it a bug? It appears more of a limiting factor due to RGB color band assignment and color matching due to several factors. Hexagon Geospatial provides an article Supervised Classification - Signature Editor - color chips where they provide a diagnosis to a similar issue you are facing. 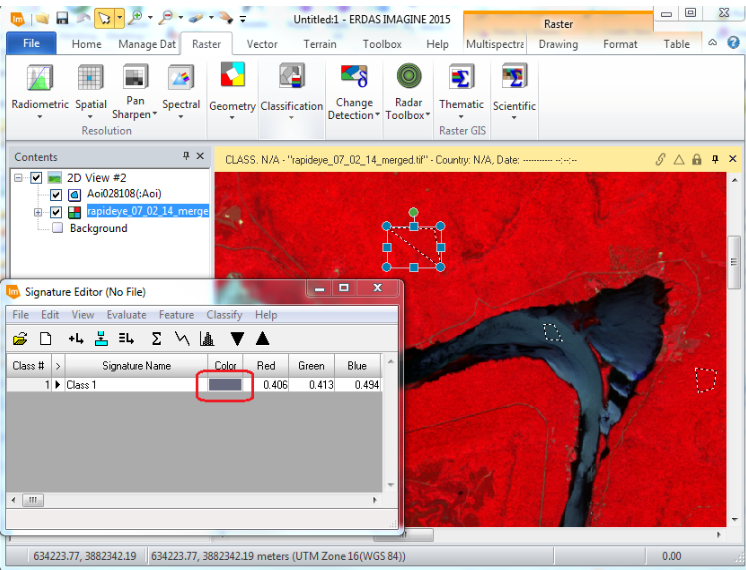 Diagnosis Training samples for supervised classification are collected, saved, and evaluated from the Signature Editor tool. The Color column in the Signature Editor is a convenient feature to identify signatures or groups of signatures by a color attribute. When a signature is added, a color chip is saved by default with an Approximate True Color representation of the RGB color band combination used to display the data. The Approximate True Color RGB color band assignment is determined by defaults from the User Interface && Session preference for Band Image RGB Channel Default settings. If another RGB channel setting is used to display the data, the color of the chip will follow the user preference, not the current RGB band color assignment. The current RGB color band asignment for the Signature Editor can be changed from the Signature Editor. The color chip column is a convenient feature for the sample collection and is not a very precise color assignment algorithm. The color matching works better in some images than others. Not the answer you're looking for? Browse other questions tagged raster layers erdas-imagine rgb debugging or ask your own question.